Fannie, Freddie Won't Write Down Mortgage Principal The nation's five largest mortgage lenders recently pledged to start writing down the principal on mortgages that are underwater. But mortgage giants Fannie Mae and Freddie Mac aren't part of the agreement and don't plan any big changes in the way they do loan modifications. Despite some green shoots in the economy, the housing sector remains weak. With 11 million Americans still underwater on their mortgages, some housing experts believe it's time for more dramatic solutions. The idea of reducing the principal on the loans of underwater homeowners used to be a fringe concept, embraced by a few outliers. Today, many policymakers believe principal reduction is necessary to keep some troubled homeowners afloat. But so far, the nation's biggest mortgage holders, Fannie Mae and Freddie Mac, haven't embraced the idea. Housing and Urban Development Secretary Shaun Donovan has argued in favor of Fannie and Freddie writing down principal for homeowners. "We do think principal reduction is a step that's important," Donovan said Wednesday. "That can be good both for homeowners and for taxpayers." There is one form of loan modification [Fannie Mae and Freddie Mac] are not pursuing, and that's principal forgiveness. 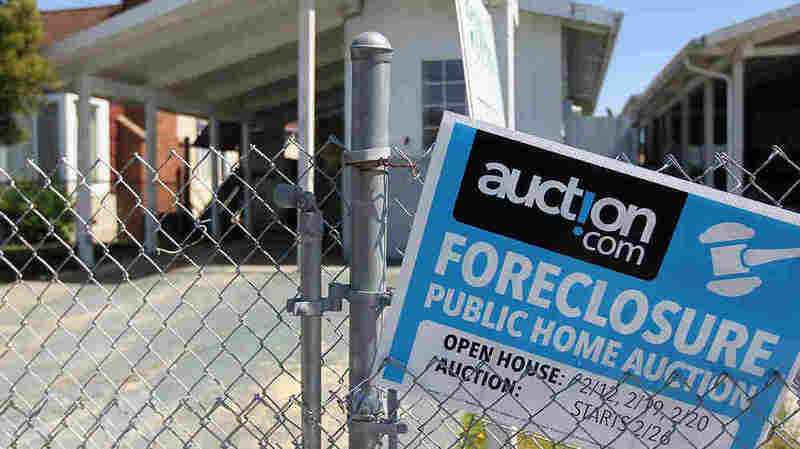 But the approach has its critics, including the Obama administration's own acting director of the Federal Housing Finance Agency, Edward DeMarco. The FHFA took over Fannie and Freddie in conservatorship three years ago, when the financial crisis prompted a massive bailout of the two companies. DeMarco, along with Donovan, spoke in Washington Wednesday at an event co-sponsored by the National Journal. DeMarco says Fannie and Freddie have modified more than 1 million loans using various means other than principal reduction. "There is one form of loan modification [Fannie Mae and Freddie Mac] are not pursuing, and that's principal forgiveness," DeMarco says. "But that does not mean that we are not making great efforts to assist troubled homeowners in underwater mortgages that have the ability to meet a mortgage obligation." DeMarco argues it doesn't matter how home loans are restructured, so long as the payment amount decreases. Fannie and Freddie are doing this, he says, not through principal forgiveness but through "forbearance of principal": charging no interest and deferring payment on principal amounts into the future. "This is an efficient way to provide assistance to the borrower [to] keep them in their home," DeMarco says. "If the borrower is successful in this modified loan, it preserves for the American taxpayer an ultimate recovery on the debt." Moreover, DeMarco says, current law doesn't give him the authority to forgive principal, even if he saw fit to do so. "If there's a larger macroeconomic or public policy purpose to serve by using taxpayer resources to provide debt forgiveness for certain homeowners, that's the judgment of elected officials," he says. Principal Reduction: A Moral Hazard? DeMarco and other critics of principal reduction say any policy that appears to pick and chose possible beneficiaries creates what's known as a moral hazard. In other words, it creates perverse incentives for people to deliberately renege on their obligations with the hope of qualifying to have some of their home loan forgiven. But HUD's Donovan says failing to reduce principal for qualifying homeowners creates its own moral hazard issues. Namely, every time a home goes into foreclosure, the neighboring homes decline in value. That means those neighboring homeowners end up holding the bag. Donovan argues the forbearance-of-principal approach doesn't create enough of an incentive for homeowners to keep paying their mortgages — especially in cases where they are deeply underwater. "If you have somebody who's going to pay for 10, 15 years and still isn't building any equity in their home, what kind of message are you sending them? What's the moral hazard there?" Donovan asks. "From my point of view, all these efforts on refinancing [and] principal reduction for the folks who are doing the right thing is going to solve a moral hazard problem." John Dilorio is CEO of 1st Alliance Lending, a company that banks hire to refinance and reduce principal on some of their loans. Private banks see the value of principal reduction, he says, so why not Fannie Mae and Freddie Mac? "They make the decision that refinance and principal reduction is more financially advantageous to them than foreclosure or short sale," Dilorio says. "So how can that be the position of the private marketplace, but not the position of the conservator of Fannie and Freddie — who are in control of far more assets?" Meanwhile, Fannie and Freddie were not party to a recent settlement between major banks and state attorneys general. That settlement included an agreement to write down $17 billion worth of homeowners' principal. Without Fannie and Freddie included in that arrangement, California Attorney General Kamala Harris says that means her work is not done. "The settlement we reached with the five big banks was good, but it was only one part of the whole issue," she says. Harris says she'll continue to work with other state attorneys general to put pressure on the Federal Housing Finance Agency to change its position.